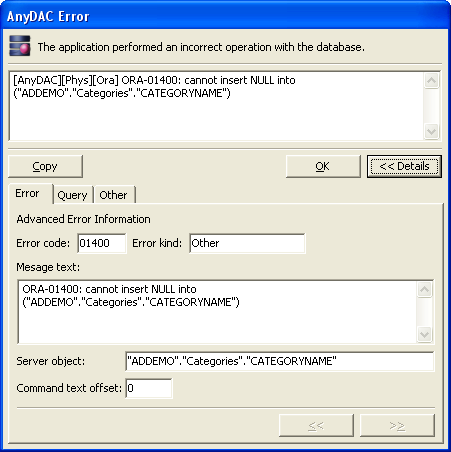 Describes how to handle database errors with FireDAC. The EADDBEngineException class is the base class for all DBMS exceptions. A single exception object is a collection of database errors, accessible through EADDBEngineException.Errors property and represented by the TADDBError class. And TADDBError has ErrorCode property - the native DBMS error code. Errors - the collection of the TADDBError objects. ErrorCount - the number of errors in Errors collection. Kind - the DBMS independent error kind. Message - the actual error message. ErrorCode - DBMS vendor specific error code. To simplify the application debugging or to make exception logging more informative, the EADDBEngineException provides the SQL and Params properties. That is the SQL command with parameter values leaded to the exception. When a SQL parsing error, then CommandTextOffset returns the offset in the SQL command text. When a constraint violation, a DB object alteration failure or some other cases, then the ObjName property returns an database object name. When a Array DML error, then RowIndex returns the array row index, to which the error belongs. setting TADConnection.OnLosted, OnRestored, OnRecover event handlers for handling connection lost errors. To use the dialog, just drop the component somewhere on a form. The dialog will hook TApplication.OnException event handler. And will popup the dialog, when there is an unhandled FireDAC exception. The "Query" page allows to see the SQL command text produced the exception. Pressing Ctrl+C in dialog will put complete exception information into clipboard.